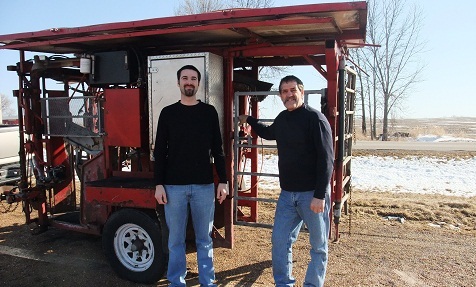 We have been a family-owned and operated bovine hoof trimming business in Wisconsin for over a decade. We care about the health of your cattle and thats why we trim hooves gently, with the least amount of stress on the animal possible. You can rest easy knowing that expert hoof trimmers with over 15 years experience and hundreds of thousands of cattle trimmed, are taking care of your herd. Preventing lameness in dairy cattle requires a regular hoof-trimming program. That said, it is also important to note that poor trimming can cause as many lameness problems as no trimming at all. Therefore, investing in an effective professional trimming program is essential. Cow lameness can be caused by a variety of interconnected, complex factors. However, the most common reason why cows develop lameness is due to the animals walking on untrimmed hooves that do not have a balanced weight-bearing surface. 1. Restoration of an even weight-bearing surface on the end of each leg. 2. Early detection of any claw lesions. Remember that over-trimming can actually contribute to lameness, so keep in mind that every cow examined will not necessarily require hoof-trimming. It is not uncommon for cows to require at least two hoof-trimmings per lactation cycle. In general, these trimmings tend to take place at dry-off and approximately 70 to 150 days into the lactation cycle. However, cows with compromised hooves may require trimmings on a more frequent basis. In addition, any cows that have extended lactation periods may require additional trimmings before dry-off. For some herds, it can be advantageous to trim heifers prior to their first calving. That said, it is important to make sure that the trimming is carried out by a skilled professional. Lame cows should also be inspected by a skilled trimmer during his or her regular visits. So, how many trimming sessions are required for a typical dairy? Well, let's consider the example of a 2000-cow dairy where dairy cows are trimmed twice per lactation cycle and the annual incidences of lameness is 45%, or 90 lameness incidences per 200 cows each year. In this case, the estimated number of hoof trims per year would be (2000 x 2) + (45 x 2000/100) = 4900 trims. Then, if a skilled trimmer can trim the hooves of 100 cows during each visit, the number of visited need each year would be 49. So, ideally, the herd would need to be visited on a weekly basis, since there are 52 weeks in the year. If a trimmer is visiting the dairy less than once a week, it should be clear to the owner that the trimmer is not adhering to an effective hoof trimming program. Similarly, if the number of visits made by the trimmer start to exceed the expected once per week average, the owner of the dairy should expect lameness rates to be high. That said, the reason for the more frequent visits could also be due to a few cows requiring trimming more often because of chronic lameness. In such a case, those animals with chronic lameness should be identified. Trimmers who complete their work very fast are more likely to miss lesions, fail to apply hoof blocks as required and make additional trimming mishaps. A comprehensive dairy cow foot healthcare program begins with professional hoof trimming. By understanding the importance of regular proper hoof trimming, dairy owners can minimize the risk of cow lameness caused by improper trimming.